Joined the Field Station team, conducted field research in Northern Province, Zambia. Briefing on research at the Lusaka Field Station. Meeting on research at the Chemistry and Soil Research Institute. A computer placed set up in the residence of a member of the staff of the Japanese Embassy in Zambia effectively works as the tool for online communication with Japan and for information gathering. A participatory database using GIS was set up in the previous fiscal year, and researchers of southern Africa have been accumulating data as necessary. In the current fiscal year, the basic geographic map, digitized elevation data, and Landsat images of Zambia have been incorporated. Further, coordination was carried out in with the staff of the Institute of Economic and Social Research, University of Zambia in preparation for a workshop scheduled in FY2006. At Mpika in Northern Province, Zambia, field research was conducted on the state of settlement in the areas covered by the TAZARA Corridor Development Project. Together with staff from the local office for the Development Project, studies on boundaries of the development areas and the state of land utilization, as well as interview with settlers, were carried out. The findings showed that most of the people who have acquired land ownership are Tongans and Mambweans from areas of high population density such as the southern provinces and area bordering Tanzania, public servants, and retirees from Tazara Railways. The findings also show that the management situation of farms varies depending upon the financial capacity of individual farm operators. The study reveals that these farms have developed close relations, through piecework employment and exchanges of farming methods, with the Bemba tribe who engage in Chitemene shifting cultivation adjacent to the development areas, and that these exchanges have become a major contributor to transformation in rural areas in Northern Province. I gave on-site education to Ms. NARISAWA Noriko, who is doing field research in Chamba Valley, Lusaka, and Ms. AWAJI Kazue, who is doing field research in Siavonga, Central Province. In Chamba Valley, farms that were owned by white settlers during the colonial era have been redistributed to Zambian people, and retired public servants who acquired ownership of the formerly white-run farms have been initiating suburban agriculture, and have built relationships with various strata of society through the union-led social development movement. A study has been launched on the migration of people between urban and rural areas in such places. 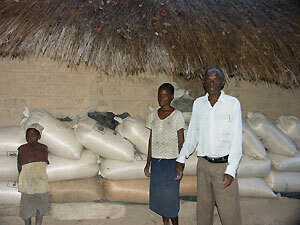 In Siavonga, Tongan people grow sorghum based on conventional farming methods on semiarid land. In southern Africa, where indigenous crops have been increasingly replaced by corn cultivation, a study has been launched on the theme of changes in agriculture in semiarid areas. Studies on Zimbabwe by Japanese researchers have so far been limited to the themes of politics, urban development, and suburban agricultural farms. As a result, no research has yet been conducted on communal land, including the residential areas of people who were deprived of their family lands by white ranchers. The seizure of white-owned farms and the resultant white of white people under the repression of President Mugabe, as well as the drastic decline in farm production, have made the political and economic situation of the country unstable. A preliminary study has been conducted with the aim of giving an account, through the livelihoods of rural people, of how this country, which was under white rule until the 1980s, is working toward political and economic independence, and in what form. 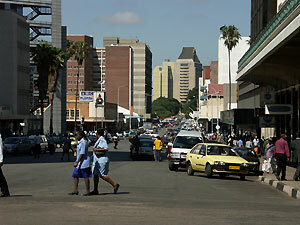 The findings reveal the fact that in Masvingo in southern Zimbabwe, commercial areas owned by white people and communal lands held by traditional chiefs exist side by side, and that in Masvingo, which was never heavily populated, white farmers occupied uninhabited bush areas, so there was little plundering of land from black people compared to the northern highland. In terms of communal land, population growth among the Shona has lead to land shortages, which are the background to the inroads made by black people into white-owned commercial areas. With backing fro the 21t Century COE program, the Zambia Field Station is planning to organize a symposium in Lusaka in the fall of 2006. Dispatched graduate students and others have been considering the theme of the symposium, based on outcomes of past field researches performed in southern Africa (Zambia, Namibia, Botswana, Malawi and Zimbabwe). 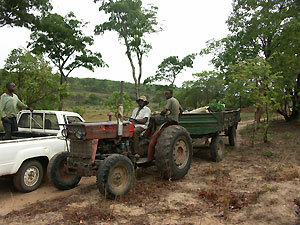 Northern Province, Zambia (1): Tongan immigrants cultivate an 18-ha farm with a tractor. 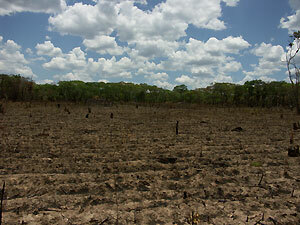 Northern Province, Zambia (2): A corn farm, cut as a square in the Miombo Woodlands. 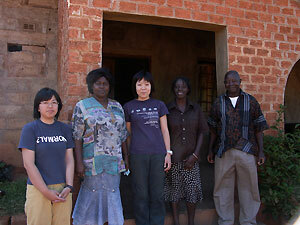 Ms. AWAJI Kazue (left) visited Ms. NARISAWA Tokuko (center) and her host family in Chamba Valley, Lusaka. A sorghum field along a valley which is covered by water during the rainy season (Siavonga). 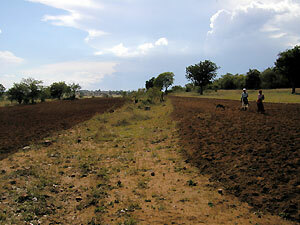 Traditional contour-ditch farming is seen in the southern Siavonga Province. 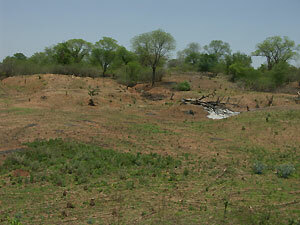 The 4-meter drainage ditch between farms was made along contours based on the instructions of the colonial government. 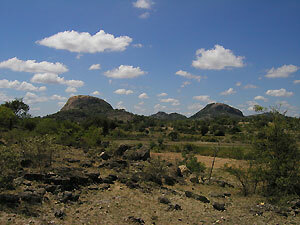 Zimbabwe (3): The beautiful scenery of Masvingo, featuring mountains made of large granite rocks.